A tactical scope determines if you are going to hit your target dead center or shoot wide off the mark. Picking the right scope for your hunting rifle can actually be a daunting task. In the world of marksmanship, having a quality scope attached on your rifle makes all the difference. Having the best 1-6x scope will put serious beginners and experienced hunters in a lot of advantages. However, as you will know, there are some key factors you must take into consideration before selecting and eventually purchasing a scope. These are just a few of the major factors that determine if a scope is the best fit for your desired purpose. To aid your selection process, we have researched and compiled a list of the best 1-6X scopes out there. Each scope included in the list has a unique feature or advantage over the others which can help you in deciding which scope is right for you. This 1-6x scope provides quick target acquisition and ranging. It has an eye relief of 3.5” to about 4”, thus making it possible to shoot effectively with both eyes open. One unbeatable advantage of this scope is its inbuilt protection against weather elements. The Primary Arms 1-6x scope is waterproof, fog proof and shock resistant. It also includes wind hold covers and flip-up caps to protect the lens from wind, dust and moisture. The reticle of the Primary Arms scope is not battery dependent. In other words, the reticle remains visible even after turning off the power. The manufacturers of this great product also offer a nice little perk in form of a windage turret cap for storing your backup battery. It comes with a reliable glass quality, which gives you clear view of the target. The daylight bright feature allows the reticle to light up bright enough so you can see clearly during the day. The 6x feature of the scope can give a clear view even at 150-200 yards. The scope works even at low-lighted areas. This item comes with a lifetime warranty. Its weather-resistant feature allows you to have a clear view even if there’s fog and rain drops. However, it is very important to remember that just like most standard rifle 1-6x scopes, the Primary Arms 1-6x scope is not a true 1x power scope. This makes it virtually impossible for it to co-witness sight on the AR platform and even co-witness with BUIS. In addition, the scope does not come with its own mounts. Therefore, scope mounts must be purchased separately. Poor illumination during bright daylight and slight difficulty in adjusting its turrets are also some of the downsides of using this scope. Regardless of these disadvantages, the Primary Arms is still a great choice if you are seeking to purchase a quality 1-6x scope. With a 3-year warranty, an affordable price tag, a range of about 12 brightness settings, crystal clear glass, great build quality and a penchant for durability, this tactical 1-6x scope is a great buy. Almost every marksman who knows his scopes can proudly testify to the fact that the Vortex scopes top the game when it comes to quality. 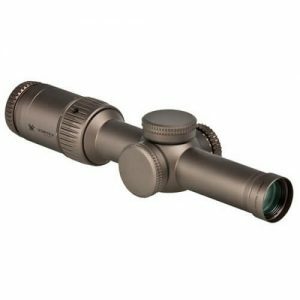 From the stables of Vortex Optics, this SFP tactical 1-6x scope has an edge over the other scopes on this list due to its ability to provide quality illumination even during daylight. It provides a range of 11 illumination intensity levels controlled with a properly placed illumination dial. The Vortex scope also has the added advantage of having exclusive rights to the JM-1 BDC reticle. This reticle is reputed to be quite simple and yet, very intuitive. It helps to facilitate fast and precise shooting at distances of even 600 yards. The glass reticle is extremely clear and the scope gives the desired and accurate zoom level. 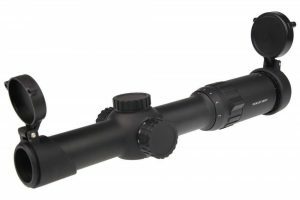 Unlike most standard scopes that make use of a 1” tube, the Vortex 1-6x scope has a 30mm aluminum tube that gifts it with improved durability and increased strength. This 1-6x tactical scope contains argon gas to prevent internal fogging and is specially designed with O-ring seals to enhance its waterproofness. With all these aforementioned advantages, the Vortex scope is indeed top of the line. Unfortunately, to enjoy this scope, you must be ready to shell out a lot of cash, as its price ranges from $1300 upwards. As it comes with no scope mounts of its own, the mounts would have to be purchased separately. Just like the Primary Arms scope, it is not a true 1x power scope, and so, cannot co-witness with BUIS. It has no flip covers and is relatively heavy. Despite its shortcomings, the Vortex 1-6x scope is accurate, well-constructed and has a lifetime warranty. If you can afford this 1-6x scope, then you would definitely enjoy your money’s worth. The Bushnell Elite Tactical 1-6x scope is the only scope on this list that is true to its 1x power specification. Being a true 1x power scope, it is able to co-witness with BUIS. With a 30mm one-piece tube forged from aluminum alloy and an SFP reticle with 11 illumination settings, the Bushnell scope provides fast target acquisition and calibrated settings for medium range shots. This scope has exclusive rights to a water-repellant coating which prevents both internal and external fogging of the eyepiece during unfavorable weather conditions. The coating eliminates the need for purchasing protective flip-up scope covers. Due to the Bushnell scope having good eye relief, it is possible to shoot with both eyes open. The Bushnell scope is vibration sensitive and has an extremely small eyebox. Its illumination is faulty and washes out in bright sunlight. With a price range of $800 upwards, this scope is a little on the high side. Despite these disadvantages, this tactical 1-6x scope is the best choice for mid-range shooting. It is precise and has accurate holdover for distant shots. It is basically a heavy duty 30mm tube made of a quality aluminum alloy. The scope is compatible with .23 Remington, AR, and other scout and patrol rifles. The illumination system has 5 levels of red and green brightness settings. Simply put, the illuminated dot in the glass-etched reticle can be changed from red to green, depending on the preference of the user. The scope has a large field of view and is able to hold zero even after several rounds of shooting. Unlike the other three scopes on this list, the TAC Vector scope comes with its own mount rings (either low weaver, high weaver or dovetail mount rings). The scope is created with impeccable workmanship, there’s nothing feels cheap when you use it. The magnification features locks, so the ring won’t spin easily. The 30mm tube allows much light to the glass giving you a clear image of your target. The crosshairs help you to have a clear and solid point to the target. The red dot is small that helps you in your precision. However, these mounts are actually of low quality and might not meet your mounting needs. Invariably, this means you would still have to purchase extra scope mounts. The eye relief is poor, making it virtually impossible to shoot with both eyes open. The illuminated dot is very small and not bright enough for daylight use. It is not a true 1x power scope and adjusting the dials and knobs require much effort. On the plus side, the recoil effect of the gun does not affect or change the magnification setting of the scope at a particular point in time due to the focus ring being quite difficult to rotate. The scope has a solid build which makes it a bit heavy. Regardless, the glass is clear and has standard crosshairs which help in giving a solid point of aim. The TAC Vector is obviously not perfect, but it is serviceable and would get the job done. Do beginners really have to buy a scope for their weapon? For this question, it’s a “Yes”, the scope helps the hunter to have a better vision of the target even if its positioned 300-400 yards away. Aspiring shooters and hunters will definitely find having a 1-6x scope useful during their training sessions. At this point, you’ve either read or glanced through the reviews of these quality 1-6x scopes, noted their benefits and limitations, and partially made up your mind on the type of scope you are going to get. Well, permit me to give you a little nudge and help you in finalizing the decision-making process. If you truly want to enjoy yourself out on the range rather than continually clamp your jaw in frustration and annoyance, then the Primary Arms 1-6x scope is the best choice. Reasons for this recommendation? Iconic scope brands such as Vortex, Leupold, Nikon, Trijicon among others cost nothing less than a thousand dollars. The Primary Arms scope boasts of such quality at not even half the price. With a price range of about $220 to $250, it is affordable to all and sundry. The rich, the middle class, the average man on the street, the optics expert and even those new to the firearms business can afford this prime piece of equipment and still be satisfied with the quality. Of course, there are cheaper scopes in the market, but none with the quality that the Primary Arms scope possesses. 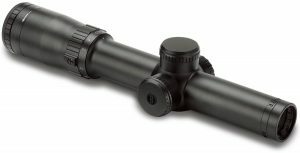 Reticles of scopes within the price range of the Primary Arms are reputed to be of low optic quality. With the Primary Arms scope, you get quality glass for such a paltry amount. The glass is amazingly bright and clear and this can be verified from the testimonies of users around the globe. Simply put, when you purchase this scope, you enjoy more than your money’s worth. It is very common for top of the line scopes such as Vortex to offer a warranty period for their scopes. The cheaper scopes in the market rarely give their consumers such privileges. The Primary Arms scope stands out in this regard as its manufacturers offer an enticing 3 years warranty on the product, giving users the confidence and peace of mind to utilize the scope to the fullest. In addition to purchasing the scope, most users always have to buy flip-up scope covers and caps for protection purposes. The Primary Arms scope solves this extra purchase problem by having its own built-in flip-up caps to protect the scope against dust, water, moisture, wind and any debris encountered during storage and even out on the range. The Primary Arms scope uses a standard CR2032 battery to provide power for operation and illumination purposes. When the power is turned off, the illumination goes off as well. However, the reticle remains visible, thus making it possible to shoot a substantial amount of rounds even with the power off. This saves power and helps increase the lifespan of the battery. In all honesty, the Primary Arms 1-6x scope sure has its shortcomings and they can’t be ignored. However, at a very affordable price, it remains the best value for quality and durability in the optics market. 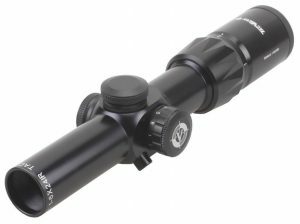 It smoothly combines the robustness and ruggedness of the most expensive scopes and the affordability of the cheap ones, and the result is a scope guaranteed to bring you satisfaction for a very long time.